This expresses mathematically the general relationships for the existence of stable phases corresponding to the equilibrium conditions (external conditions like temperature and pressure). It enables us to predict and check the processes that occur in alloys during heating or cooling. 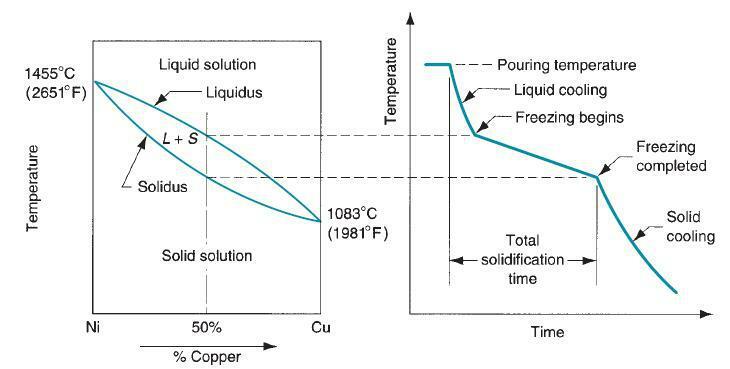 Using this rule, it is possible to determine whether the solidification process takes place at a constant temperature or within a certain temperature interval; it can also indicate the number of phases that can exist simultaneously in a system. Where P(C - 1) denotes the total number of compositional variables when P phases are there in the system. Including the two external variables (pressure and temperature), the total number of variables is P(C - 1) + 2 . Obviously, the number of phases in a system cannot exceed the number of components plus one. The components of a system may be elements, ions or compounds. The components refer to the independent chemical species that comprises the system. In the ice-stream system, the component is H2O, in the Cu-Ni system the components are the elements Cu and Ni, whereas in the Al2O3-Cr2O3 system, one can take the two oxides to be components, nut it may be convenient to choose Fe and Fe3C (Iron carbide) as the components. As follows from the phase rule, the number of phases existing simultaneously in a binary system cannot be more than three. These three phases can only exist at a definite phase composition and a definite temperature. If the number of phases in a binary system turns out to be more than three, this means that either the alloy is not in the equilibrium state or the number of phases and constituents has been determined incorrectly. In a ternary system no more than four phases may be in equilibrium. When only one phase is present in a system, the degree of freedom are equal to the total variable, with the increase in number of phases, the degree of freedom decrease. The degree of freedom cannot be less than zero. Obviously, we have an upper limit to the number of phases that can exist in equilibrium in a given system. 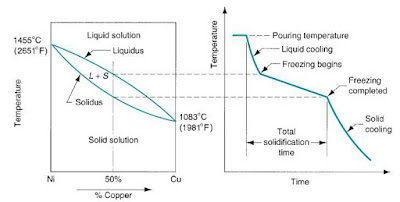 At solidification temperature, a pure metal is a one-component system consisting of two phases of identical composition. Clearly, the number of phases and number of degrees of freedom equals zero, i.e., F = 0. This is known as non-variant equilibrium. When the number of phases is less than the maximum possible number by one, the number of degrees of freedom will also increase by one (F = 1). Such type of system is called as monovariant. An alloy of two metals is a two-phase and two-component system at solidification, F = 1. When F = 2, the system is said to be a divarient. Obviously, a system may be in equilibrium at different temperatures and concentrations. One can represent all transformations occurring in alloys and depending on temperature and concentration (C = 2) by equilibrium diagrams. The equilibrium diagrams are plotted with concentration as the abscissa and temperature as ordinate.